INTRODUCTION: 2010 has turned out to be the year of awesome collections so far, with "Chimerascope" the 5th superb such that I read this year and 3rd published in 2010, while the other two have been published in late 2009. I have reviewed "In the Valley of the Kings" by Terrence Holt, "Things We Didn't See Coming" by Steven Amsterdam and "Objects of Worship" by Claude Lalumiere here on FBC and I wrote a detailed mini-review of "A Handful of Pearls" by Beth Bernobich on Goodreads, with a complete review to come here closer to the revised June publication date. Douglas Smith's debut collection "Impossibilia" which I reviewed last year and which has in the lead story "Bouquet of Flowers in a Vase, by Van Gogh" one of those rare "become a fan for life" pieces, made reading "Chimerascope" a must as soon as I have found out about it. Adding that it has been published by Chi-Zine publications from whom I have read only quality works so far and "Chimerascope" came with the highest expectations for me and it matched them and more with several mind-blowing stories in an ensemble of all-high-level ones. FORMAT/CLASSIFICATION: Standing at 332 pages, "Chimerascope" contains 16 stories (17 in the special limited signed hardcover edition), mostly previously published and showcasing the author's versatility. There is an introduction by noted author Julie Czerneda and each story comes with author's notes about how it developed and reactions to it. The stories range from far-flung sf and time-travel, to fantasy-like landscapes and even towards straight horror, so "Chimerascope" as befits its name is a changeable entity, one that cannot be easily confined into a narrow pattern and will appeal to fans to all kinds of speculative fiction. ANALYSIS: If there is a theme to such a complex collection, it is "change and adaptability". And while the heroes and heroines of the stories here are confronted by major upheavals and challenges, not all manage to overcome them successfully, or sometimes the price is just too high. I will present a short discussion story by story, while I recommend to check the excerpt site linked above for a taste of each of the pieces in the collection. The Red Bird Changing style and tone from the dark tale of the Rippers above, we move here to a mythical fantasy-like medieval Japan, a strange temple and the even stranger bird from the title. Young Asai becomes the last warrior of the "Red Bird", but when the local warlord decides to sacrifice a whole village to get the secret of the temple, what will he do? State of Disorder Another core story of the collection, this one involves time-travel, revenge and as nasty a villain as it gets on a personal scale. A chilling story of three dinners in the same place and time and a very satisfying ending made this another A++ story for me. A Taste Sweet and Salty Another superb story about a man that dies every night, only to wake up as someone generally different the next day; all happens in a town from which escape seems impossible until the main hero has an insight; unpredictable and with a great ending this story is another highlight of the collection and the one non-sf A++ for me. 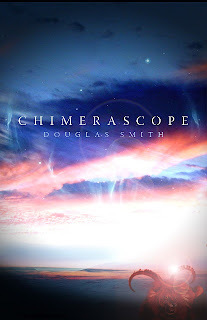 In conclusion I would say that "Chimerascope" (A+ overall) confirms for me what "Impossibilia" affirmed, namely that Douglas Smith is an extraordinary author whom every lover of quality speculative fiction should read. I should received my copy of this one yesterday. Looks really good. I bought it because earlier they had David Nickle's "Monstrous Affections" as well, which is also a strong collection, but it is mostly horror.